4A Centre for Contemporary Asian Art brings together its two artists performing as part of AsiaTOPA, Abdullah M.I. Syed and Eugenia Lim, for a conversation on the means of production, narratives of capitalism and power in The Currency Exchange. Both Abdullah’s and Eugenia’s work engages directly and indirectly with currencies, trade and labour in the modern market and both are presenting newly commissioned performance works as part of AsiaTOPA. Flying Buck Exchange is a special presentation of an ongoing ‘bucking’ performance project by Pakistani-Australian artist Abdullah M.I. Syed. 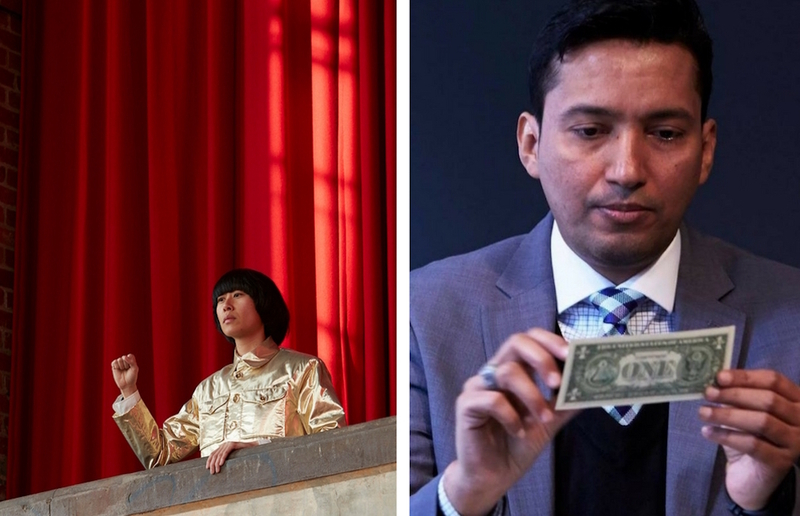 Showcased over four days at MPavilion as part of the inaugural Asia TOPA, Syed’s tongue-in-cheek turn of phrase, Bucking, will see him consuming, distributing and exchanging currency, in this case, fabled US dollar bills. With an immediate playfulness on the surface and more complex renderings of the dysfunctions of global market economies laying underneath, Flying Buck Exchange explores the dissemination of power, and intrinsic neo-colonial concerns, utilising the US dollar bill as a powerful instrument to address the micro and the macro. Where the body of the artist is in immediate play, occupied in acts of repetition and endurance, so too is the larger body of the audience, which becomes an unwitting beneficiary of this seemingly innocuous act of engagement. Innocence and familiarity are tropes that draw those present into the field of action, however the medium itself and the progression of the performance into a more sombre and painful reality rapidly bring darker concerns hurtling to the forefront. Flying Buck Exchange is a fascinating and at times confronting look at the central role that currency plays in economies of consumption and exchange and how money often navigates cultural and political identities. Artist Abdullah M.I. Syed presents five intertwined yet unique works across four days at MPavilion. Abdullah M.I. Syed will be live at MPavilion for four more events in the coming days. Scroll down and click through for further details. This is the opening performance of the Flying Buck Exchange, a special presentation of an ongoing ‘bucking’ performance project by Pakistani-Australian artist Abdullah M.I. Syed. Showcased over four days at MPavilion as part of the inaugural Asia TOPA, Syed’s tongue-in-cheek turn of phrase, Bucking, will see him consuming, distributing and exchanging currency, in this case, fabled US dollar bills. Continuing with its humorous play on the word ‘bucking’ and performed through the duration of his residency at MPavilion in its fifth iteration (previously this work has been articulated in Pakistan, Hong Kong, New Zealand and Australia), Abdullah M.I. Syed’s The Art of Consumption brings to the fore inherent narratives of institutionalism, capitalism and consumer culture, as the artist literally consumes currency, in this case, in the form of the fabled US dollar bills. Join artist Abdullah M. I. Syed for The Art of Trade and share your skills—whether they be in lifesaving, Australian citizenship test questions, or another area of expertise. If your personal knowledge is deemed worthy, you will be paid by the artist for your services. In this work, as with all Flying Buck Exchange performances, the playfulness disguises more complex renderings of the dysfunctions of global market economies, the dissemination of power, and intrinsic neo-colonial concerns, as the US dollar bill becomes a powerful instrument of addressing the micro and the macro. In his final performance as part of Flying Buck Exchange, Abdullah M. I. Syed distributes currency—in the form of the fabled US dollar—through acts of creative labour. In The Art of Distribution, Abdullah will surprise and delight the audience as he gives away money. What are the powers at play in acts of distribution? And will you leave with a handful of cash?